The story takes place in Tokyo Butei High School, a special school where armed detectives  "Butei"  are trained to use weapons. Kinji Tooyama is a second-year-student who has a special ability, but he keeps it a secret to maintain an ordinary, peaceful life. However, when he gets caught in a bombing on the way to school, he encounters H. Aria Kanzaki, the most powerful S-Rank Butei student in Assault Studies. 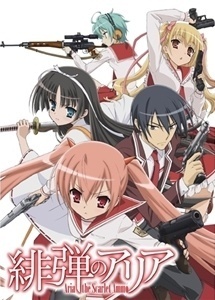 Watch Hidan no Aria Episodes Online at Animegg.org. Hidan no Aria is available in High Definition only through Animegg.org. Choose an episode below and start watching Hidan no Aria in Subbed & Dubbed HD now.